The world of King Conan as envisioned by this creative team is exceedingly harsh and unforgiving, and there is certainly no room for meek hearts. In this second issue, our hero’s journey truly begins only to be halted almost immediately by his first major obstacle. The decision to take his men through the ‘green hell’ of the Pict inhabited forest comes with a heavy price, and ultimately leads to his capture. Things are complicated further with the discovery that the Pict armies have banded together under one leader, and are building momentum for war. Writer Timothy Truman offers the character no quarter, backing him into a corner and having him return to his baser instincts. For Conan, pain and death are seemingly as inescapable as his shadow, but there’s a brutal, believable honesty in how the other characters who populate this world embrace the moment of their death. In this issue, a character is immolated in a harrowing moment that exemplifies my point (which also highlighted how the correct choice of onomatopoeia can help elevate a scene). However, whether the impact comes from a character’s pose, a face etched with both terror and shock, or a bravado-laden speech as death washes over them, no-one in this world feels perfunctory; a testament to the truly spectacular work being done here. Tomas Giorello’s characters appear chiselled from granite, given weight and definition by deft hatching that verges on the imperceptible, and Jose Villarubia’s wonderfully understated colours. They are built perfectly to carry the weight of Truman’s affected fantasy-intoned script, and never has such bloodthirsty brutality looked so beautiful. 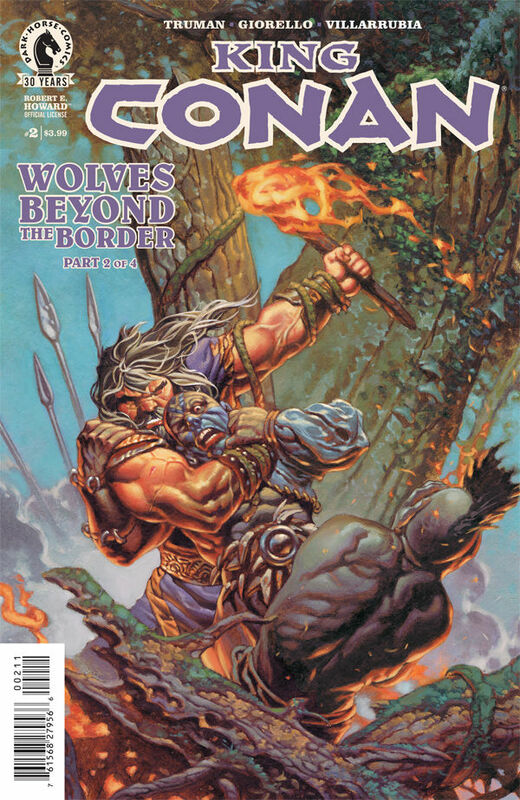 The issue closes with a cleverly disguised bait and switch, and it was only on a second reading I noted the skewed composition of War Chief Bril and his Wolf Clan’s entrance, perhaps foreshadowing their intentions. The tale so far packs all the excitement and spectacle you’d expect from the title, and is certainly worthy of the ‘high adventure’ tag. If the same high standard continues into the final two issues, the series will surely be remembered as a fitting addition to Robert E. Howard’s existing lore.